This 1966 Pontiac GTO is a beautifully restored car, but the owner wanted to upgrade the braking performance a bit with some new disc brakes. He also wanted the ability to change the look of the car without doing any permanent modifications, so the Goat got a new pair of shoes. Here, the V8 Speed & Resto Shop Crew installs a new power disc brake kit from OPGI and adds a set of 18” Rocket Racing Booster wheels wrapped in Toyo Tires modified by Diamond Back Classics with goldlines. Now, the GTO stops easier and can wear the original Rally 1 wheels or switch to the Rockets for a split personality. This clean 1969 Chevrolet Corvette Roadster is currently powered by an anemic small block Chevy and shifted with a factory 4 speed manual transmission. The combo is cool, but the owner wants to add more zip to this machine so he elected to go with a GM Performance Parts LS3 crate engine with Holley EFI and a Tremec T56 6-speed manual. Follow along as the V8 Speed & Resto Shop crew complete this transformation and add some additional upgrades from Detroit Speed, Wilwood brakes, and YearOne wheels. We all dig Hot Wheels cars, and Sean Svendsen builds cusom versions that go to a whole new level of cool. 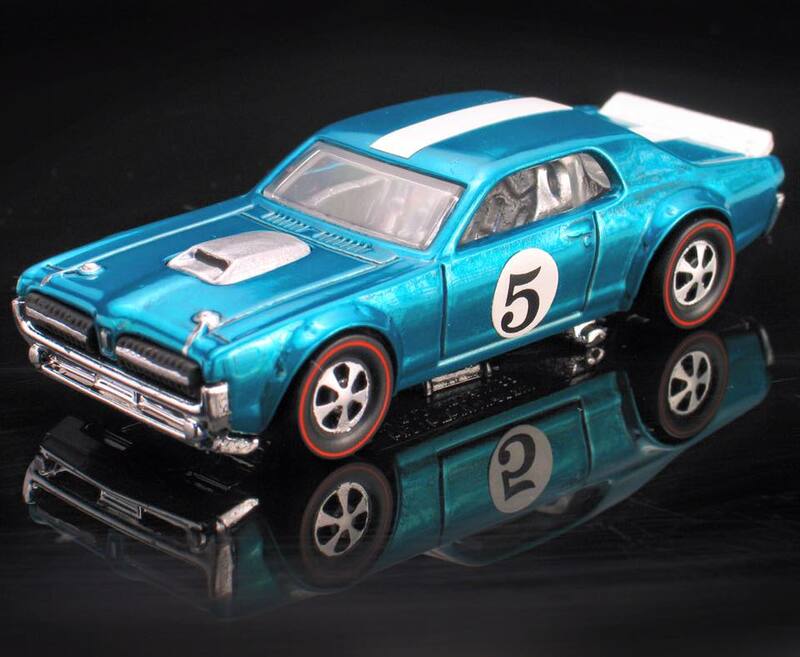 He strips the cars, polishes the bodies, sprays them with Spectraflame transluceant paint for a vintage look, re-tires them with reproduction redlines, and the results are awesome. These are just some of the cars he's done, and you can see his other creations, including model kits and artwork, at his website www.svensworldofwheels.com. We'd love to build some full-size versions of these at the V8 Speed & Resto Shop. Which is your favorite? 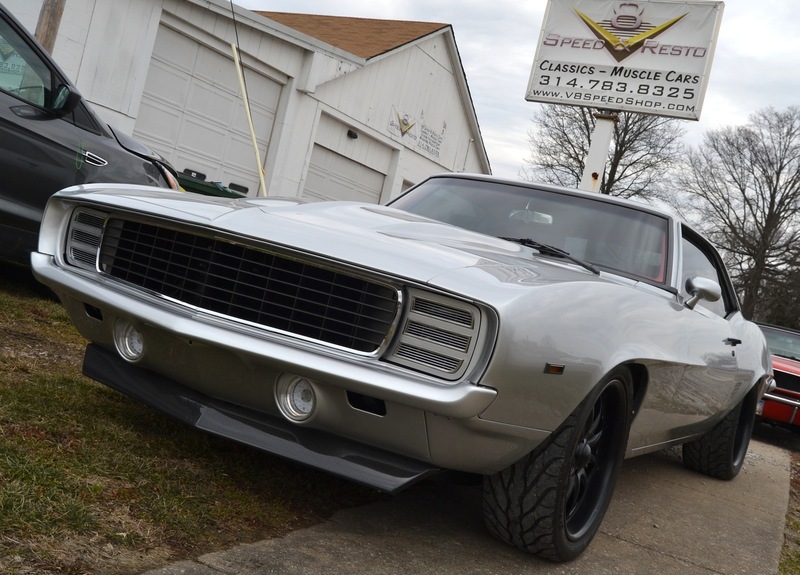 The 1969 Chevrolet Camaro is one of the iconic Muscle Cars, and we work on a lot of them in our shop. Which is not to say that we don't work on other Classics and Muscle Cars, it's just that we've built some pretty stout 1969 Camaros over the years, so people know they can send us their projects for restoration, performance upgrades, or other needs. This time, a complete, freshly-restored '69 arrived in the V8 Speed & Resto Shop after the owner drove the Shafiroff 540 cubic-inch Big Block Chevy powered beast and determined the car needed more traction. We worked with the owner to make a list of improvements, including a complete Detroit Speed suspension system front and rear, some fuel injection modifications, exhaust upgrades, and some other items to make the car more enjoyable to the owner. The challenge was to perform the modifications without damaging the car's beautiful silver paint! Check out the photos to see the progess. The new HDX series from Dakota Digital is the latest in aftermarket automotive instrumentation technology. HDX takes personalization and usability to a whole new dimension while retaining your favorite features from the wildly popular VHX-series such as LED backlighting for the numbers, tick marks and dead-faced dash indicators (turn signals, high beam, check engine, cruise control engaged and parking brake). Illuminated needles and a lifetime warranty are still part of the deal as well. These features add up to a clean, easy to read instrument system in all conditions. Precision stepper motors provide accurate needle movement along with a full-sweep at key-on, and the needle hubs are black nickel plated spun-aluminum. Available with your choice of black or silver alloy gauge-face styling, each HDX system allows the user to select their favorite illumination color for the gauge readings and needles, as well as the TFT message center displays. 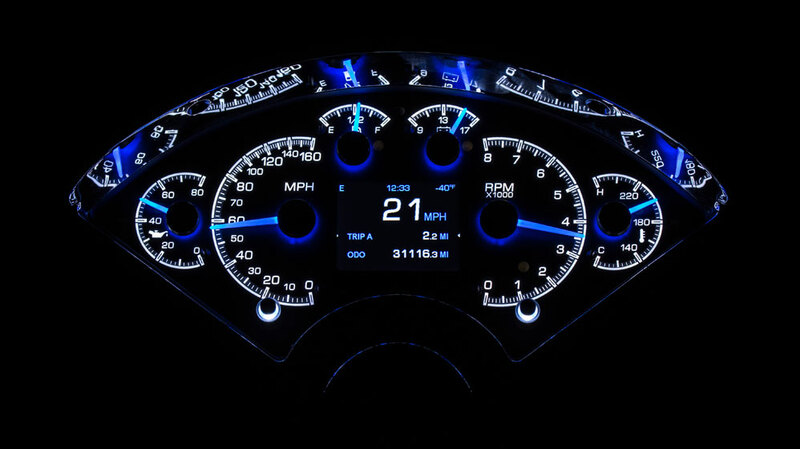 RGB LEDs are incorporated into the circuit boards for fully-adjustable display colors, allowing the user to personalize their instrument system to match nearly any vehicle theme. Calibration and personal settings can be manipulated with the lighted, capacitive-touch buttons integrated into each HDX system, or the available Bluetooth app for Apple and Android devices. With the instrument system dialed in, including calibration of the speedometer and fuel gauge, the system can calculate your remaining fuel range, expressed in miles to empty. Every kit is supplied with an optional buzzer for feedback each time a button is pressed. Further, the buzzer can emit a warning tone for each reading at a user-defined set point to coincide with the dead-faced, red warning lights incorporated into the gauge faces. Vehicle integration through a central control box has become a calling card for Dakota Digital, and the advantages are substantial. Most notably, installation is greatly simplified; two power (constant and switched) and one ground connection get things up and running, while vehicle-harness sourced signals and sensor inputs run cleanly to their respective terminal. Supplied, solid state sending units with weather-tight harnesses ensure trouble-free operation. The control box allows for easier service, a nicer-looking finished product, in addition to an abundance of technology packed into a vintage dashboard. It's always disappointing to see a beautifully restored Classic or Muscle Car with hacked-up dash stuffed with a radio that does not fit or match the car. We're not talking about custom or high-end installs, but rather about the fact that radios with modern features simply don't fit in classic 2-shaft radio holes. This is exactly why Custom Autosound developed a line of in-dash radios that offer all the features people want today... high power, AM/FM/auxiliary input, iPhone connectivity, USB connection, MP3 player, bluetooth capability, and more... and packaged it in a radio that not only fits the original dash, it matches the look! In this video, we install a Custom Autosound Slidebar radio into a beautiful red 1957 Chevy Bel Air. The Slidebar Radio features all the elements mentioned earlier, including an innovative "slidebar" which conceals the modern digital face with a vintage-looking AM dial. This radio not only fits the dash of the 1957 Chevy, it matches the look. We completed the installation with "The System", consisting of a hidden powered subwoofer and remote satellite speakers to hide our high-performance audio system in plain sight. It looks great, and sounds awesome! Holley Performance Products tall LS valve covers are the latest addition to our extensive line of GM LS engine components that will add a custom touch to your engine bay and help you to stand out from the crowd. These valve covers were designed to add an additional 0.54” of internal clearance over factory height valve covers. The valve covers retain Holley’s signature integrated angled coil mounts, and the hi-tech look and performance of coil-on-cover applications. The Holley tall LS valve covers fit LS1, LS2, LS3, LS6 and LS7 engines using coils with a standard LS3 bolt spacing of 72mm. These valve covers come ready for installation with an OE style baffle and ventilation system, lengthened factory style mounting hardware, plus a billet aluminum oil fill cap. Installers are encouraged to reuse or replace the original gaskets specific to their application. 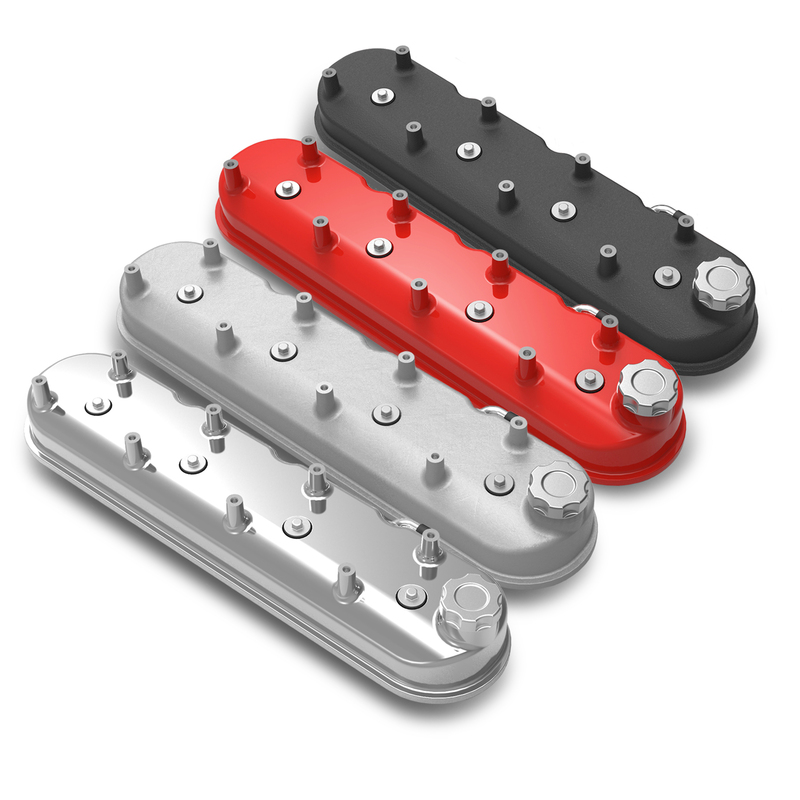 The Holley tall LS valve covers are die-cast to ensure high quality and detail. They are offered in four finishes to best fit your individual style. See more at www.holley.com. These Ford Racing cast iron exhaust manifolds are perfect for those building hot rods or just replacing their stock manifolds. Ford Racing designs these manifolds to hug the block, making them perfect for cars, trucks, and hot rods with limited clearances under the hood. The castings use the best materials possible to resist cracking or warping and are optimized to maximize flow to help your car make the most power possible with a smooth power band. When it comes time to get your car on the road, you can trust Ford Racing and these cast iron exhaust manifolds. Call 314.783.8325 for pricing and availability.